What's left of the Fort Frog compound can be seen smoldering May 22 after a fire destroyed it. An Aspen Skiing Co., employee was charged with arson Wednesday in connection with the blaze. 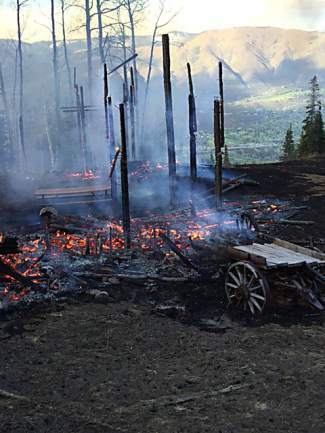 The U.S. Forest Service has issued a citation to the people it believes are responsible for a fire Sunday on Buttermilk Mountain that destroyed the Fort Frog compound. Aspen Fire Protection District Chief Rick Balentine issued a statement Friday that said the Forest Service issued the citation Monday, the day after the fire. When asked whether the cause of the fire could be determined, both Balentine and Forest Service law enforcement officer Chris Mandrick wouldn’t say whether the cause is known, but the Fire Department’s statement did include a warning to campers to make sure campfires and smoking materials are extinguished before leaving a campsite. The agencies aren’t releasing the names of the people involved at this time and wouldn’t comment on the number of people involved. A call reporting the fire came in just after 6 p.m. Sunday. The compound was a popular children’s center on the mountain, featuring a wooden, frontier-style fort with lookout towers, flags, old wagons, a jail, a saloon and a Native American tepee village, according to the Sanctuaries in the Snow blog. “Fort Frog was an important part of the Buttermilk experience for many years and for thousands of kids. We are sad to see it gone and will explore our options for rebuilding in the future,” Aspen Skiing Co. spokesman Jeff Hanle said earlier this week via email. Pitkin County Sheriff’s Deputy George Kremer said about 1 acre of forest burned in the fire but that it didn’t spread thanks to melting snow on nearby ski runs.